With the beta release of Android P, Google is making available a new navigation system: Gestures. This replaces the Back-Home-Recents navigation scheme that Android has used for years with quick swipes and slides. I’ve been using the P beta build with gestures enabled on my Pixel 2 since it was released at Google I/O, so I’ve had some time to get acclimated. Early impressions come off as something of a mixed bag—it’s a good start, but there’s still work to do. Gestures were easier to get adjusted to than I expected, so the transition was quick. Some of the gestures are also quicker than their button tapping counterpart, which is nice. On the other side of that coin, a few of these gestures are actually much more difficult than just using the buttons—like opening apps in split-screen, for example. With buttons, you just long-press Recents, and then pick your apps. It’s easy. With Gestures, you have to open the Recents menu, long-press the icon for the app, select “split-screen,” and then choose your second app. It’s not intuitive at all and takes about five times longer than before. But I digress—this is a quick overview of how to use gestures and how they’re different, so I’m getting ahead of myself. Let’s take a closer look at these gestures, how they work for the time being, and what we hope changes before the official release of Android P.
Note: Gestures are still clearly in beta and are unfinished. This is nothing more than an early look at what Google has cooking. Things could (and very well may) change before gesture navigation becomes mainstream on Android. First things first, let’s talk about how to turn this on. To get started, go ahead and give the notification bar a pair of tugs to expose the full Quick Settings menu. 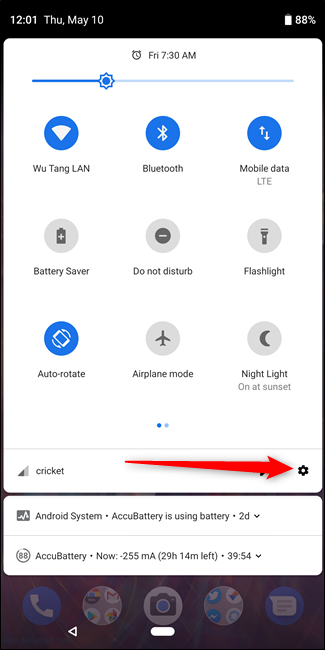 Tap the cog icon to jump into the Settings menu.